North of Geraldton you’ll find two towns on opposite ends of Highway 548 – Nakina, and Aroland. Nakina is village of approximately 500 people on Highway 584. 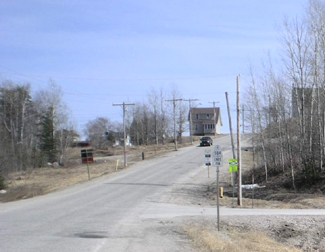 The village is situated approximately 60 kilometres north of Geraldton – making Nakina one of Ontario’s more remote towns on the road network. With 500 people today, Nakina is essentially the remnants of an old railway town. The town was founded in 1913 due to the junction of the railway – after Nakina the rail lines branch southwards towards Toronto or east towards Quebec. This made Nakina an ideal spot for a railway centre. In its heyday, Nakina has a fully functioning roundhouse, with fuel, servicing, and train-turning facilities. The 1940s saw Nakina get a radar base. Built in World War Two, the base was designed to protect the important locks between Lakes Huron and Superior at Sault Ste. Marie. Like many of Canada’s old radar bases, it was operated by the United States, but dismantled soon after the Second World War. Nakina hit a boom in the 1970s when, in addition to its railway functions, the town was home to a large paper mill. This boosted the population to nearly double what it is today. Currently, however, minerals exploration and tourism are the largest industries today. Nakina is a starting point for many northern fly-in lodges. You can fly to lakes such as Makokibatan, part of the Albany River system. 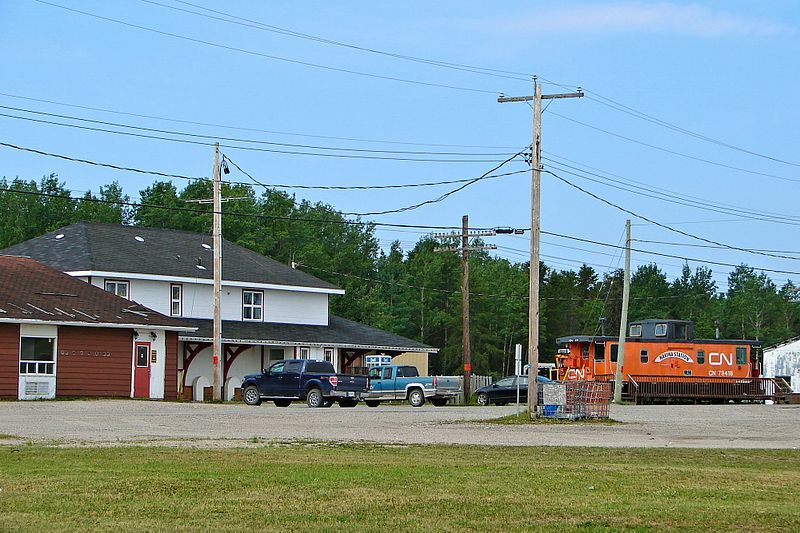 Fish for walleye, northern pike as well as brook trout.With both the pulp and railway industries definitely on the wane, it may be hard for Nakina to stem out-migration and beat the odds of being such a remote, northern town. Nakina advertizes along Highway 11 with its mascot, the “Nakina Mosquita”… I wish I had taken a photo of one of those signs. Thanks to Keith for sending in the photos of the rail station and of the end of Highway 584. 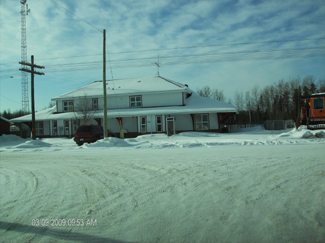 Aroland is an Oji-Cree First Nations town about 20 kilometres northwest of Nakina off Highway 584 on Highway 643. Approximately 300 people live in the community. The surrounding area was a traditional camping ground in the late 18th and early 19th centuries due to good hunting, fishing and trapping. The Hudson Bay Company set up a trading post at nearby Kawpaskagami Lake in the early 1900s. The railway expanded to the area in 1911. According to the Chiefs of Ontario website, the Arrow Land and Logging Company, which operated in the area from 1933 to 1941, employed many Band members and contributed to the establishment of a permanent community. This entry was posted in The Interior and tagged dot on the map, festivals, first nations, military, pulp and paper, railway by Highway11.ca Editor. Bookmark the permalink. Hello all, I stumbled across this website during my research. I plan to visit Nakina in the future for a book I am working on. I’m interested in speaking with locals who know a bit about the history of the area, specifically north of Greenstone. There was a disappearance of a young man in that area (Sandor Lingman in 1960) and unfortunately, there is no information about this incident. He was supposedly working for KRNO mines at the time, but I cannot confirm that. My book aims to raise awareness and remind people of the names of those who were lost in the Ontario bush. If anyone has any information, I would love to hear from you. Hi Brian – can you confirm there is a reunion in August 2018. I was raised in Nakina (10years) my father was the Game Warden thru the 1950s. Wife and I camped out at Twin Lakes in 2015 – first time back. I would like to attend a reunion. Looking at the museum site it looks like there is a reunion in 2018. Hello Willie Soderman, Nakina”s 95th August 3rd to 6th 2018. The town backhoe dug up a couple of artifacts at Soderman’s farm last year. They were a Singletree (used with horses to pull wagons ect. and a skidding grapple (used to skid trees). We have them at the museum and I will send you photos. Thanks brian . I remember a small barn. Maybe he had a horse , or he may have used Sirens horse. hello there and thanks to your information – I’ve certainly picked up anything new from right here. I did then again experience a few technical issues using this site, as I experienced to reload the web site many occasions previous to I may just get it to load properly. I had been pondering in case your hosting is OK? No longer that I’m complaining, but slow loading cases occasions will very frequently have an effect on your placement in google and could injury your high-quality score if ads with Adwords. Well I am including this RSS to my email and could glance out for much extra of your respective exciting content. Make sure you update this again soon..